Intense storm with high winds and hail about to overtake us from the southwest near Lake Norden, SD. Ahead of the main line of storms east of Lake Poinsett, SD just across the border into MN. Looking north at the severe warned, intense line of storms quickly moving to the east as we attempted to stay ahead heading into southwest MN. Severe warned storm and clearly ingesting tons of low level moisture right into the base near Tyler, MN. I did not notice this until putting the chase log together, but there is a funnel and even a dirt swirl underneath between the two trees on the left-center side of the image. This was looking to our southwest, so the tornado was down even longer than I thought. This was taken shortly before a farmer came flying into the area where we were parked, laying on his horn, and yelling about seeing a tornado. He was right! Taken after seeing the weak tornado near Amiret at the storm base that was starting to look a bit more outflow dominant. 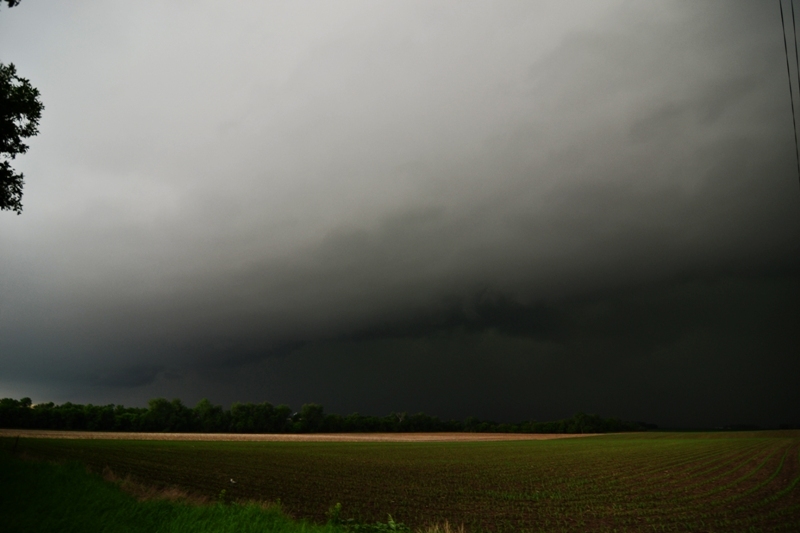 Shelf cloud at the end of the chase near Wabasso, MN. This was one of those days where I almost decided not to go, pulled the trigger to head out, and did not regret the decision. It’s not too often where I’ll blow off a chase when I have the opportunity and time to do it. Leading up to this day, it looked pretty decent in regards to supercell and even tornado potential. Insane instability in the 4,000-5,000 j/kg range was in the forecast ahead of a surface low and south of a warm front from eastern SD into southwest MN, while a subtle shortwave was expected to trigger intense thunderstorms during the afternoon hours. The caveat was what a complex of morning storms in SD would end up doing as they progressed into eastern SD and southern MN and if this would indeed be the main show, primarily a wind/hail threat with shelf clouds and really low tornado potential. Wes Hyduke and I left Burnsville, MN around 11:30am and headed west on Hwy 212 towards SD. On the way, we watched on radar as a complex of intense severe thunderstorms advanced across SD with numerous severe thunderstorm warnings for damaging winds and hail along the storm path. This was my fear for the day as I thought this would be it, but the line of storms began to break apart into individual storms as it moved into eastern SD. 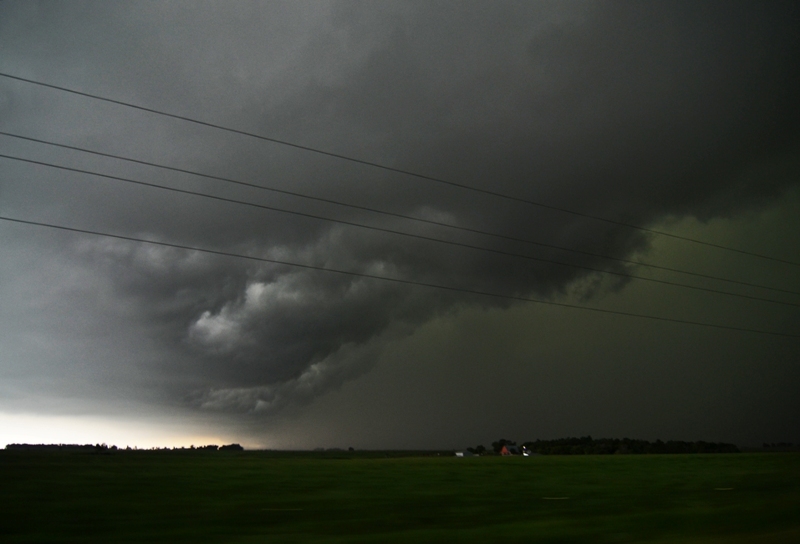 We were still in MN heading west on 212 when the storms started to become tornado warned. A mesoscale discussion was issued by SPC at 1:34pm, highlighting an area ahead of these storms and into southwest MN on the northward retreating warm front where severe weather was expected through the afternoon. A Tornado Watch soon followed at 2:00pm CDT. As we approached Watertown, SD, tornadoes were being confirmed on the storm near Redfield, SD but there was no way we were going to make it. Instead, we traveled south on Hwy 81 and west on Hwy 28, intercepting a tornado warned storm near Lake Norden. This storm was a beast and was starting to wrap a strong and large hook around the core at 50 mph. The thought was to get to a main road and travel north to stay ahead of the hook and attempt to look into the notch of the storm, but we quickly became overcome by the intense rain core with small hail that packed 60 mph winds as we turned around on Hwy 28 and attempted to get out of the way. 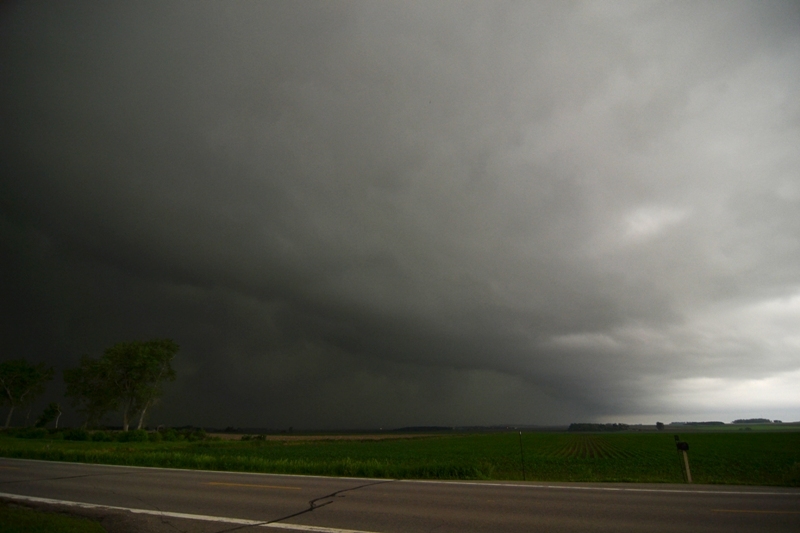 Our route took us on Hwy 28 to the east of Lake Poinsett where the storm became very intense before we finally got to the eastern edge of the core as we entered into MN. I’m glad we got out of there, as there were extreme high winds in this storm that led to a fatality at Lake Poinsett due to a trailer being lifted off the ground and slammed back down. We continued to progress east into MN and stair step south towards Tyler, MN where we intercepted the tail end storm on what was becoming a bowing line to the north. As we got on the storm, you could tell that this was not becoming outflow dominant just yet. There was a lowering and what soon became a wall cloud as we progressed east on 160th St to the east of Tyler. The storm was obviously still in a decent low level helicity environment as there was a lot of motion, scud rising and falling, and continued strong inflow into the storm. 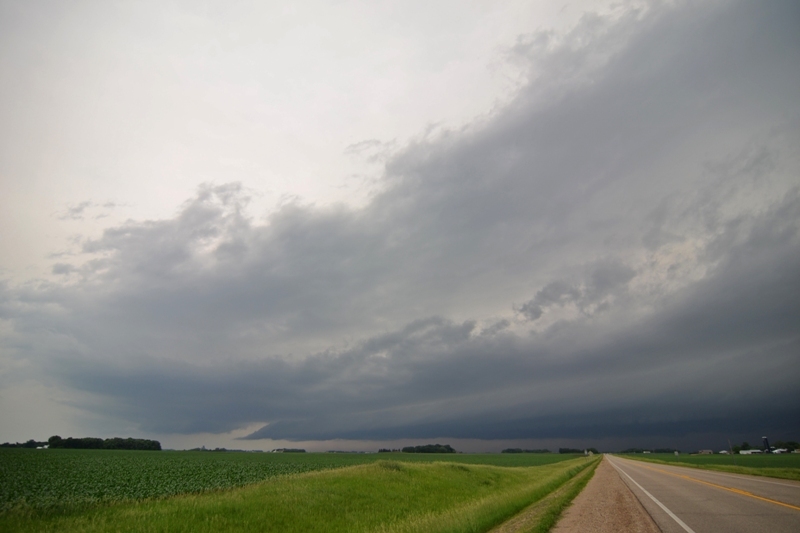 As we stopped to watch under a slowly rotating mesocyclone near Amiret, MN and 8 miles northwest of Tracy, a spin-up occurred to our southwest. We watched as what looked to be a strong dust devil moved to our southeast and then to the east on our road. It was really cool to get on video what was a weak tornado right in front of us! We were able to get within about 50 yards, maybe less, before the tornado went into a field to our north and continued on. This tornado was down for several minutes before we could not see the ground rotation and debris field anymore. At first, this looked like a strong dust devil or gustnado, but there was definitely a rotating mesocyclone overhead and a funnel that others documented as well, so classifying it as a tornado for sure. After having this close encounter, we stayed ahead of the storm as we traveled towards New Ulm and it weakened, and then headed for home on Hwy 169 thereafter.